Although the major problems covered in Fast Fixes for 3 Common Mistakes–backscatter and loss of color–are significant and common flaws in underwater photographs, they are by no means the only ones. The challenges of underwater photography–an environment hostile to electronics, a water column that absorbs light and fish that won’t obey directions–greatly multiply the number of things that can ruin an otherwise good image. The keys are accurately diagnosing the problem, learning the technical skills to correct it next time in the water, and never forgetting that while everyone makes mistakes, successful photography happens to those who learn from them. What it looks like: Dark spots or blank areas on an image, entire image out of focus, etc. What causes it: Dark spots or out-of-focus spots on the final picture may be the result of leaving a drop of water or fingerprint smudge on the rear element of the lens. Something small may not show up, but a large glob of O-ring grease will definitely be a problem. Photo 1 shows the result of leaving a drop of water on the rear lens element, and I have 35 more just like it (see the hexagonal dark spot in the photo’s upper left, just above the lobster’s antennae). These aberrations are difficult to spot during a dive because the rear element of an amphibious lens is not visible to the diver. Even with an SLR, the problems might not show up through the viewfinder. How to fix it: One solution is to have meticulous work habits when servicing O-rings or when changing lenses, and to double-check the rear element each time the lens is mounted. It is also prudent to have at least a few rolls of film processed on location whenever possible. What it looks like: An image that contains multiple “ghost” images of the subject in motion. What causes it: Most modern SLR cameras synchronize with a strobe at a shutter speed of 1/250th of a second–fast enough to freeze most action under water. But the fastest sync speed on a Nikonos V, for example, is only 1/90th of a second. Since the strobe’s burst is usually around 1/4000th of a second, most action can be frozen by the Nikonos V so long as the subject is illuminated only by the strobe. However, on a coral reef at midday, two sources of light will illuminate the subject: strobe and ambient light. The result can be that two images of the subject–one lighted by the strobe, one by ambient light during the time the shutter was open–can be recorded on the film. How to fix it: With quickly moving subjects, use the fastest sync speed available for your camera. Normally, you should hold the camera stationary so you are not creating camera motion problems to go along with ghost images, but with some particularly fast critters you may consider “panning” with the motion. Moving the camera at a speed and direction to approximate that of the subject will make the fish sharper, but the stationary background may blur. 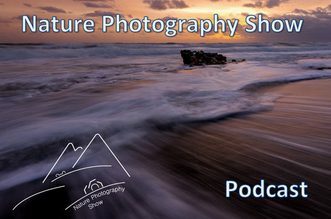 Sometimes, slow shutter speeds are purposely used with “rear curtain sync” (the strobe is triggered at the close of the shutter cycle rather than the beginning) so as to create intentional blur behind the moving subject to give the illusion of motion. What it looks like: Gawky, inelegant positioning of human models and marine life. What causes it: As Photo 3 from Grand Cayman’s Stingray City shows, it is difficult to capture a diver and marine life together in perfect position, with the eyes of both visible to the lens and in focus. Things can happen quickly with animal subjects, making bad compositions inevitable. How to fix it: Don’t sweat the bad compositions. When photographing divers and marine life interaction, use a strobe that recycles rapidly, and be prepared to shoot lots of film in order to capture a few exceptional images. Even fashion photographers use high-speed motor drives, and their human subjects usually take directions a lot better than fish. What it looks like: The most common form of slide film processing is referred to as E-6, the latest in a series of developer formulations by Eastman Kodak. There are a series of chemical baths that must be held in tight tolerance for temperature, replenishment rate (unless one-shot chemicals are used), and even then the sequence in which the chemicals bathe the film. Faulty processing or bad chemicals can mar your images in a number of ways. What causes it: Photo 4 shows the effect of reversing the normal order of the E-6 processing baths. But the more common problem is underexposure due to exhausted or under-replenished developers. This is an especially vexing problem because it makes diagnosing exposure problems difficult: Are the bad exposures something you did wrong or bad processing chemicals? How to fix it: If all the film you submitted, both topside and under water, comes back with the same problem–i.e., underexposed–yet you know you bracketed and used exposure settings that have given good results in the past, you may assume processing was at fault. Nothing can be done to rescue that batch of images, but now you know to find a more reliable lab. Never give your entire shoot to be developed to an untested, unproven lab, if you can help it. And shoot a roll of Sunny 16 exposures (see “Surefire Exposures”) as your own test of any suspicious processor. What it looks like: Stationary objects and their backgrounds are unintentionally blurred. What causes it: A number of factors: (1) Improperly setting the distance scale with a lens that offers minimal depth of field (i.e., the Nikonos 35mm lens) is the most common error. (2) Using a wide-angle or zoom lens behind a dome port can cause this problem if the lens does not focus close enough for the dome’s virtual image. The virtual image is generally located at a distance approximately twice the diameter of the dome. Thus a six-inch dome will have a virtual image about 12 inches away. If the lens can’t focus this close, it won’t focus at all. (3) A loose rear lens element will also cause the lens to fall out of focus. How to fix it: Carefully check the focus on the ground glass of your SLR, and when using Nikonos cameras estimate distances accurately. Remember, with a Nikonos your lens is calibrated in “apparent” distance, so even if you were to measure with a yardstick you’d still have to consider refraction. Use a quality loupe (Schneider 4X or equivalent) when editing to make sure photos are tack-sharp. Zoom lenses in housings almost always require the use of a diopter (close-up lens) to bring the minimum focus near enough to capture the virtual image. Finally, after repeated trips in airline baggage compartments, you may need to check that the rear element of your lens is still secure in its mount. 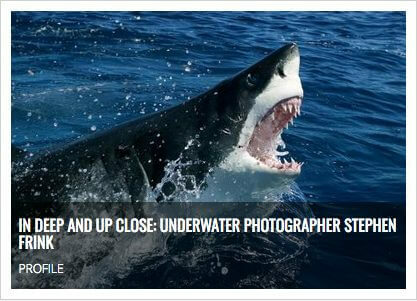 Underwater photographer for commercial assignment, editorial, and stock photographs. Stephen Frink is a prolific and highly skilled underwater photographer, with long experience in creating advertising campaigns and editorial features. He is the publisher of Alert Diver Magazine, an upscale quarterly publication for the Divers Alert Network. Other Frink companies include SEACAM USA, the North American distributor for SEACAM underwater camera housings, and WaterHouse Photo Tours, dedicated to advanced underwater photo instruction and photo tours.